Become part of a strong and loving community of like-minded teachers who will support you every step along the way. 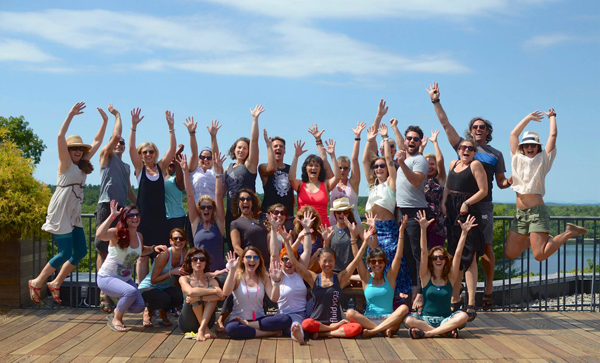 Within the framework of a Yoga Alliance-certified curriculum, our 200-hour program focuses on personal enrichment, the discovery of your individual path, building community, inspiring leadership and cultivating a network of teachers whose offerings are intelligent by design and fluid by nature. The Fluid Yoga 500hr training in an additional 300 hours of training beyond completion of a minimum of 200 hours of yoga teacher training and the approach is based on the belief that we are able to best serve our students and community when we ourselves feel grounded, whole and content. Designed for those looking to deepen their yoga practice but not necessarily become registered yoga teachers. SPA Yoga is a slow-flow, floor-based, whole-body sensory experience based on Fluid Yoga sequencing. By engaging all five of the senses with soft candlelight, soothing music, aromatherapy, lots of hands-on assists and a renewed awareness of taste (and sometimes chocolate! ), Spa aligns practitioners with the inner wisdom of deep relaxation. The physical practice takes time to open the body’s subtle energy and prepares students to experience new depths of awareness in an extended, guided shavasana. Healing Yoga fuses the therapeutic effects of yoga poses, breathing and meditation with the traditional evidence-based techniques of physical therapy. Cuing and alignment is based on what is optimal for the individual instead of the broad spectrum of different bodies. Your body is unique, and the poses that work for your body are uniquely special. Alicia will help you find what works for your specific needs. Fluid Assisting workshops will teach the difference between adjusting and assisting; how to approach hands-on work safely for the practitioner and adjuster alike; and help attendees understand how to non-verbally communicate with students.